Step by Step - is a revolutionary musical entertainment, this is a real music studio, both for experienced musicians and beginners you can take with you! With the Step by Step, you can make music anywhere! 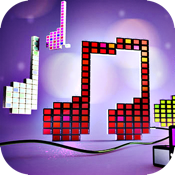 It is fast, compact and powerful application for creating music. With which you can create any kind of songs and tracks. Without any musical knowledge. You can easily create a musical masterpiece that can truly be proud of. In an application built many tools and synths. Flexible configuration will help you choose the best sound. You do not have that will not deter other than your imagination! In the next update will add a song to share with your friends online. While she is working under Beta. With our program you can repeat such as music tracks from the movie Pirates of the Caribbean, Game of Thrones song Coldplay - Clocks and many more! Thumb controlled interface, simply click on the matrix to add notes, select different instruments and percussion on the right hand side and let it all come together. Advanced options is where the FX / Key / Scale and tones can be changed.